Dhaka, 10 October, Abnews: Nikki Haley, the first American of Indian descent to hold a cabinet-level position in the US, resigned as Ambassador to the UN on Tuesday and said that despite speculations she was not planning to run for President in 2020. 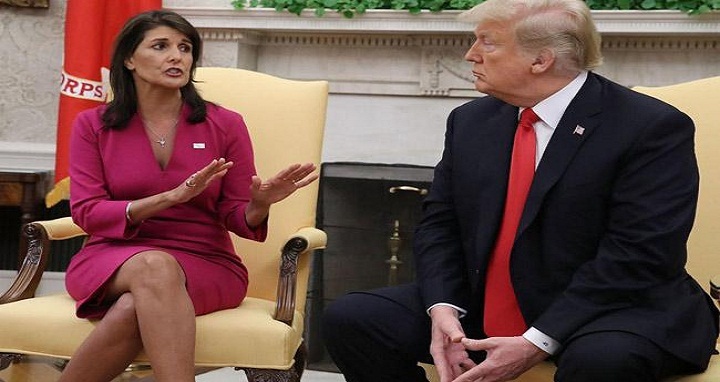 CNN said that Haley sent her resignation directly to President Donald Trump, who told reporters in the Oval Office that she would be leaving the post at the end of the year after doing ‘an incredible job’. Joined by the former South Carolina Governor in the Oval Office, Trump invited her to come back in a different role. ‘You can have your pick,’ he said. In December 2017, she said that the women who had accused Trump of sexual assault ‘should be heard’. At one point she suggested that Trump’s rhetoric could trigger a world war. From the beginning of her tenure, Haley stood out as a fierce advocate of Trump administration’s policies, announcing the US would be ‘taking names’ of countries that did not support US votes, the Washington Post said.